According to a recent report by the Northern Echo, Newcastle United are willing to give up Dwight Gayle in their efforts to land Tom Cairney from Fulham during the summer transfer period. The same source has revealed that the Magpies are planning to send Gayle to Craven Cottage if they can secure the services of Cairney in this off-season. The Cottagers midfielder has been ravaged by injuries this season which is why he has been a forgotten man in the Premier League. The fact that Scott Parker’s men have already been relegated to the EFL Championship doesn’t bode well for their chances of keeping hold of their best players ahead of the new campaign. Hence, a potential swap deal might be on the horizon which could benefit all parties. 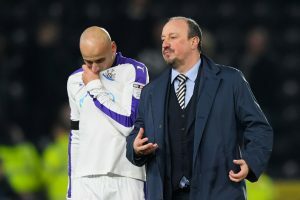 Newcastle are in dire need of strengthening their options at the centre of the park so a move for Cairney could help them create more opportunities from midfield next season. 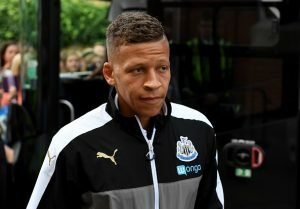 Why Dwight Gayle Could Be A Useful Asset At Craven Cottage Next Season? In contrast, the Whites of West London can also reap the rewards of recruiting a Championship-proven player like Gayle. The English forward has scored 21 goals and provided seven assists in 36 appearances while on loan at West Bromwich Albion this season. There is no doubt that he has what it takes to be a success story at Craven Cottage. 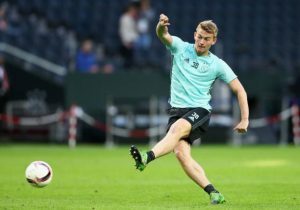 What Will Cairney Bring To The Tyneside Club? Cairney had finally started to show some glimpses of his brilliance when he opened the goal-scoring in Fulham’s 2-0 win over Everton last weekend. The Nottingham born talent is an excellent distributor of the ball and has a wide range of passes in his locker. He is also capable of making some driving runs from midfield but lacks the pace to beat his marker in 1v1 situations. Cairney-Gayle Swap Deal: Good Move For All Parties? Rafael Benitez needs a player with a bit of oomph in central midfield so Cairney can potentially be a realistic option for him to consider ahead of the new campaign. If the Magpies can manage to seal a permanent move for Salomon Rondon, then there is no reason why they would want to keep Gayle at St. James Park. Hence, a potential Cairney-Gayle could be a good move for everyone involved. 3 Alternatives For 25 Y/O Serie B Striker At Leeds United Including This Newcastle United Forward! 3 Replacements For This Argentine Starlet At Leeds United Including This Former Hull City Forward! 3 Replacements For 25 Y/O Serie B Forward At Leeds United Including This Newcastle United Ace!